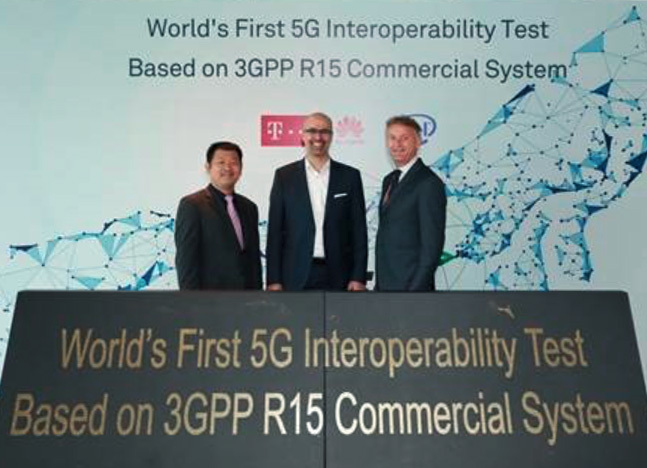 Huawei, Intel and Deutsche Telekom announcing the completion of the world's first 5G interoperability test. Photo: HuaweiIn 2018, nothing can get approved in 3GPP that China strongly opposes. In the past, 3GPP often was a battle between a few American giants and their European peers. A Qualcomm or a Nokia will still be heard, but the power has shifted. I haven't seen evidence that the Chinese influence has made for better or worse standards. There are now over a billion 4G subscribers at the big 3 Chinese telcos, by far the largest equipment buyers. Nokia, Ericsson, and the other vendors do not dare oppose their largest customers. Qualcomm, which sends 60 people to 3PPP, has been in crisis as the Chinese have held up their $44B purchase of NXP. The stock dropped $10B after the 4/16 ZTE incident. "There are more than 30 Chinese people holding key positions in the standards organization, voting power exceeds 23%, the number of contributions is 30%, and lead projects account for 40%." Some 3GPP working groups have open mailing lists, where I see Chinese submissions are ubiquitous. The Chinese companies are now working together closely, under public pressure. $50B Lenovo makes phones as well as computers and made the mistake of supporting a Qualcomm proposal over a Chinese one. They have been eviscerated as "unpatriotic" by the Chinese press and made a public statement they have changed their vote. ITU standards are dominated by CJK, China, Japan, and Korea. I'm on the U.S. State Department ITAC, where CJK majorities at ITU meetings are common. The United States under Trump has been speaking out on the U.S. role in standards. The U.S. blocking of Broadcom/Qualcomm was justified as "protecting American leadership in standards." All governments lie, but I think this claim was strictly ignorance. In the last ten years, the U.S. has become a secondary player in standards. For anyone still doubting the ability of China to take a lead in telecom, here's a recent award. The panel was distinguished and largely from Europe and the U.S.
Local Time: Thursday, April 18, 2019 09:55 AM PDT – Page Load: 0.2573 Sec.